The insanity of the early Cold War manifested itself perfectly in the Atomic Cannon, built by the US in the early '50s to shoot nukes out of artillery. It turns out that the Russians built a nuclear gun, too. This is Objeckt 271, also referred to as 2A3 Kondensator 2P. It hails from the Soviet's Stalinist era, known by military historians as the "my tank is bigger than yours" period. Put simply, the Kondensator 2P was a huge self-propelled howitzer with a gigantic barrel made to shoot nukes. If this sounds like a bad idea to you, congratulations, you are more sane than the early Soviet military industrial complex. Before explaining exactly what was wrong with shooting a nuke out of a gun, let me cover the specs of this machine. As you can tell, that is a very large, very heavy tank. Why did the Soviets build it? Well, they saw that the Americans had one, so they didn't want to be the only nuclear superpower without a really big nuclear gun. In 1953, us Americans built "Atomic Annie," an 85-ton, 280mm howitzer that shot a nuclear round called "Little Fella." We actually tried this out in the Grable Test. The film is unreal. So the Soviets saw Atomic Annie first in Germany in 1952 and then in Eisenhower's inaugural parade in '53. The Ruskies immediately ordered their own and finished building four gigantic rear-facing artillery pieces between 1955 and 1956 according to RussianWarrior.com. 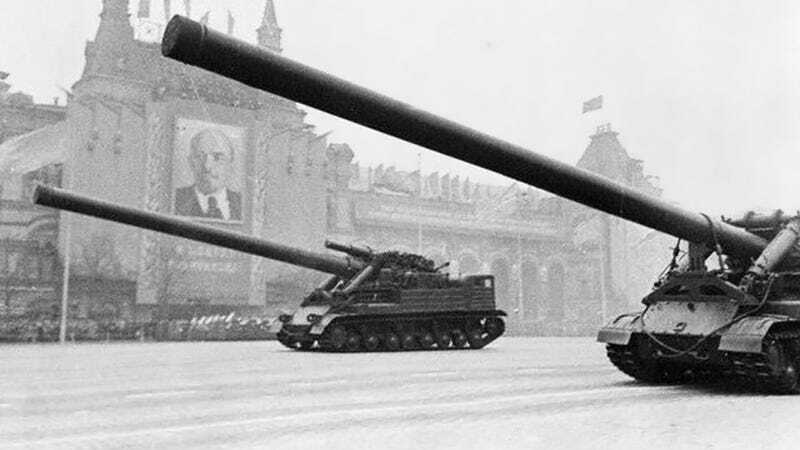 The Soviets finally got to parade their own phallic nuke-gun in '57. The Kondensator 2P's twin, the 2B1 OKA, was also present. It had a 420mm caliber and an even longer barrel, with a range of 45 km. Here is what appears to be film of that parade. It turned out that even with its heavily reinforced body and suspension, the Kondensator's recoil was too much to handle. Nobody ever deployed the howitzer for anything more than tests. English Russia reports that the whole thing rolled back several meters when firing and all sources agree that firing the gun often broke the Kondensator's frame. You might say to yourself, why would anyone build a tank that's so big and so slow, when you could just shoot nukes with, like, rockets? Well, that's exactly what Nikita Kruschev's administration said in the mid 1960s, shutting down this tank's entire program. So ended the brief and absurd life of the Kondensator-2P. Two remain on display in Moscow at the Central Armed Forces Museum (below), and St. Petersburg's Artillery Museum.